Equip your commercial kitchen with the Winco RW-S450 Electric 100-Cup Rice Warmer. 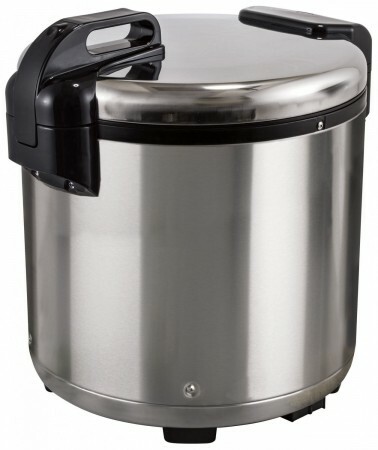 Designed to hold up to 100 cups of uncooked rice or around 200 cups of cooked rice, this warmer is perfect for high volume restaurants and catering companies. Built with premium electrical parts made in Korea and Japan, this rice warmer ensures superior performance and consistent results. Dependable and exceptionally durable, this rice warmer is a great addition to your food service facility. This rice warmer has a heavy-duty stainless steel body which will resist rust and corrosion while its fingerprint-proof satin finish provides a sleek, clean look that befits your professional setting. Equipped with a non-stick inner pot, this rice warmer seals in moisture and makes removing rice easy for fast serving. This rice warmer is also hassle free to clean and perfect for fast-paced environments. Thanks to its energy efficient heat absorption system, this appliance will keep your rice warm for up to 24 hours. Dimensions: 16 13/16" x 16 13/16" x 17 1/2"